Information regarding the number of medical practitioners in medieval Islamic cities is meagre and difficult to interpret. It has been estimated that in Baghdad in 931 (319 H) there was a ratio of about one physician per 300 inhabitants. Doubtless there were areas, particularly rural ones, where there was no formally trained physician at all, for there were many self-help guides to basic medical care intended for use in traveling and when no physician was available. At the top of the profession in terms of prestige and income were those enjoying the patronage of a caliph, ruler or vizier. Such positions were not without risk, however, for the patron could be at times ruthless or whimsical. Rulers were known even to confiscate libraries or imprison their physician, and more than one physician lost favor rapidly through failing to cure a powerful patron. Some of the most learned physicians excelled in other fields, such as theology and philosophy, and won acclaim and income by teaching or writing in these areas. It seems that association with a hospital was a mark of prominence, and only the more respected had such positions. Aside from those who enjoyed the favor of a wealthy person, it is likely that the majority of doctors had incomes similar to those of shop-keepers or merchants. Among the writings of nearly all the learned physicians are anecdotes about inept physicians, quacks, and charlatans. The extent to which charlatans were a serious problem is difficult to gauge. Descriptions and criticisms of the inept and the fraudulent were also frequently part of treatises dealing with the general topic of medical ethics. In Arabic literature such deontological treatises, which also outlined the behaviour and training of good physicians, were part of a wider genre known as adab, devoted to proper social conduct. As there was a literature concerned with codes of conduct, the question arises whether there was any way of enforcing such standards. There was certainly no uniformity in the education and training of a physician. There were families of physicians in which the training was primarily within the family. The Bakhtishu` family is the most obvious, but there were also many others, such as the Ibn Zuhr family consisting of 5 generations of Spanish physicians, including two women physicians who served the household of the Almohad ruler Abu Yusuf Ya`qub al-Mansur, who ruled from 1184 to 1199 (580-595 H). There were self-taught physicians, such as Ibn Sina, who claimed to be self-taught in medicine though he studied other subjects with masters. Most medical instruction was probably acquired through private tutoring and supervision. Some teaching occurred in hospitals, especially in Baghdad and later in Damascus and Cairo. There were also some madrasahs, or mosque schools, which offered instruction to a few of its students in medicine and other ancillary subjects such as mathematics. Islamic law (fiqh), however, was the primary focus of these institutions. There is evidence that the great medical teacher of Damascus, al-Dakhwar, established upon his death a madrasah which was devoted solely to instruction in medicine. The school opened, with considerable ceremony, in 1231 (628 H), about a month after al-Dakhwar died. Later sources state that it was still in existence in 1417 (820 H), when it underwent some repairs. A loose sheet with a bloodletting figure having points labeled that were thought best for phlebotomy. Such figures are derivative from late medieval European bloodletting figures. With such a mixed system of education, the curriculum and training of physicians was not at all uniform, standardized, or controlled. In certain regions the functioning of the medical profession was overseen by a Chief of Physicians (ra'is al-atibba') and an Inspector of Public Services (muhtasib). We know very little about the actual duties of the Chief of Physicians. Of the muhtasib, or Inspector of Public Services, we know considerably more. Some of his responsibilities might include seeing that correct weights and measures were employed, insisting upon proper street cleaning, seeing that a ramshackle building was condemned, ensuring a supply of clean water, and other related matters, but the functions varied to some extent by locality. A number of manuals were written as guides for an Inspector in the performance of his duties. Prior to the 12th century they only briefly mentioned the medical profession, and then mostly in relation to matters of drugs, weights, and measures. During the reign of Saladin, however, a physician working in Aleppo by the name of al-Shayzari wrote a manual in which he discussed in considerable detail the supervising of the medical community. According to his manual, the Inspector was to administer the Hippocratic oath to physicians. The oculists were to be qualified on the basis of the book Ten Treatises on the Eye written by Hunayn ibn Ishaq; bonesetters were to be tested with the Arabic translation of the surgical portion of a Greek medical encyclopaedia written about 642 in Alexandria by Paul of Aegina; and surgeons had to know a particular book of Galen. Later manuals repeated these requirements. We have little evidence as to what extent and how uniformily such a practice of examination was actually carried out. It has been sometimes asserted that a physician in the medieval Islamic world was granted a license (ijazah) following the completion of his education. 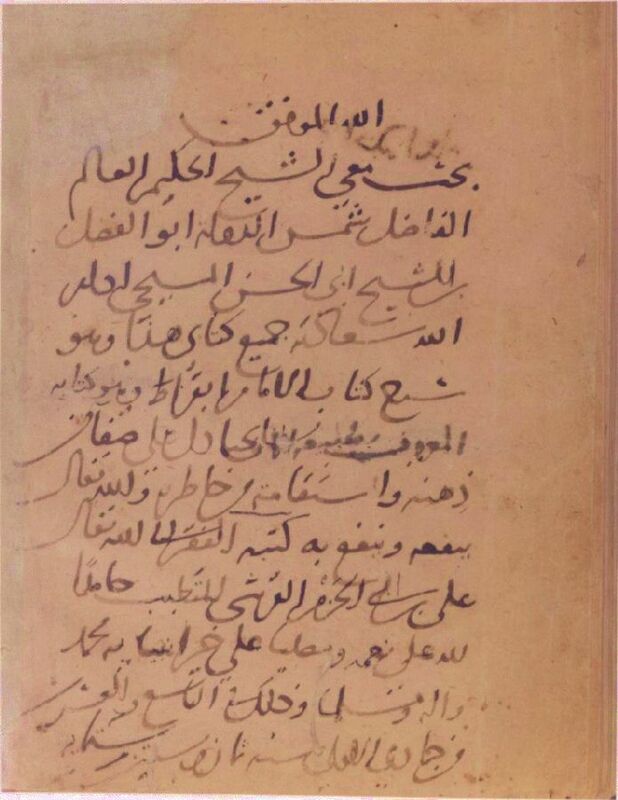 The signed statement made by Ibn al-Nafis (d. 1288/687 H) that his student, a Christian named Shams al-Dawlah Abu al-Fadl ibn Abi al-Hasan al-Masihi, had read and mastered Ibn al-Nafis's commentary on a Hippocratic treatise. The certificate is in the handwriting of Ibn al-Nafis himself and dated the 29th of Jumada I in 668 H (25 January 1270). [In the name of] God the Provider of Good Fortune. The wise, the learned, the excellent shaykh Shams al-Dawlah Abu al-Fadl ibn al-shaykh Abi al-Hasan al-Masihi, may God make long lasting his good fortune, studied with me this entire book of mine -- that is, the commentary on the book by the imam Hippocrates, which is to say his book known as `On the Nature of Man' -- by which he demonstrated the clarity of his intellect and the correctness of his thought, may God grant him benefit and may he make use of it. Certified by the poor in need of God, `Ali ibn Abi al-Hazm al-Qurashi [known as Ibn al-Nafis] the physician. Praise be to God for his perfection and prayers for the best of His prophets, Muhammad, and his family. And that is on the twenty-ninth of Jumada I [in the] year six hundred and sixty eight [= AD 25 January 1270]. In another recorded example, also from the 13th century, the physician Muwaffaq al-Din Ya`qub al-Samiri wrote at the back of a copy of a commentary on a treatise by Hunayn ibn Ishaq that a student named Amin al-Dawlah Tadrus had read the text before him with the purpose of understanding, questioning and verifying its contents. These individual cases of the certified completion of a reading course, as important as they are for the history of medical education, are not, however, equivalent to the licensing of physicians upon completion of an approved period of training. In addition, the term ijazah, often translated as `license,' is not entirely applicable to these examples, for an ijazah was traditionally given in the fields of law and theology (especially fiqh and hadith) and were recorded in medieval bio-bibliographical registers for those fields in order to establish chains of authorities. There is no similar role for certificates in the medical literature. While many advocated high medical standards and the exposure of frauds, there is at present insufficient evidence to substantiate the claim that there was an organized and centralized system of official examination and testing of physicians, even in a relatively restricted geographical area.